What It’s About: A mysterious preacher (Clint Eastwood) shows up at a mining camp and helps rally its inhabitants against the depredations of Coy LaHood (Richard Dysart), his mining corporation, and the thugs he employs. What is the secret of the Preacher’s past, and will he stay to help the miners when push comes to shove? Why Watch it Today? 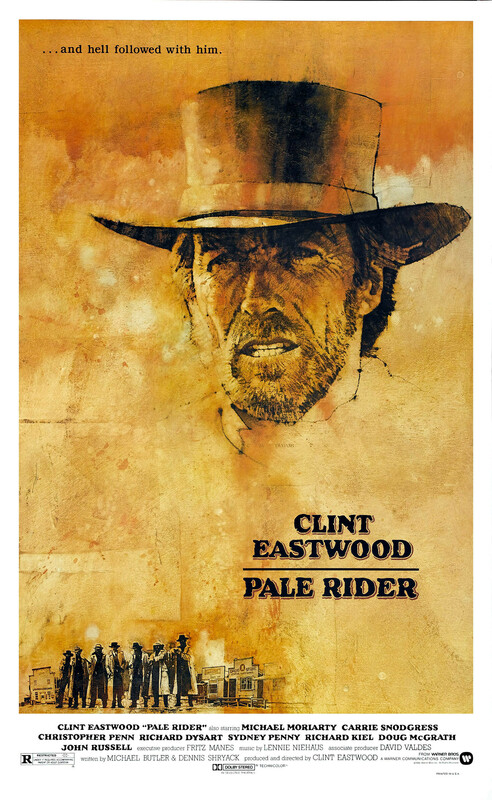 : Pale Rider was a staple on cable in the mid-to-late-80s, a Western that my father and brother could agree on, meaning I saw it quite a few times. When I got older I realized that it is a very strange remake of Shane (easy to miss considering Eastwood piles on many of his own quirks and makes everything that Shane says subtly explicit). Shane was released today in 1953. This entry was posted in Action, Coming of Age, Ghost, Independent, Movie of the Day, Period Film, Remake, Western and tagged Billy Drago, Carrie Snodgress, Chris Penn, Clint Eastwood, evil businessman, giant, gold panners, gunfighter, John Russell, Michael Moriarty, mine, miners, preacher, Richard Dysart, Richard Kiel, showdown, small town, stealth remake, The Malpaso Company, town vs. rednecks.